Folks, every day I start my day perusing various non main stream alternate news. What amazes me most is the so called truther’s in the complete know, yet have no clue who the Sinai-Gog of Satan is, spew the same ole, same ole useless garbage. They rave on and on about a mysterious group of “Illuminati” or Khazarian Mafia, etc. But have yet to point out who, or identify the individuals, always just an untouchable, invisible, group. I find this to be a diversion. Yapping on and on about the zionist….blah blah blah. All the while bending the knees to the other jews of Talmud bavli, calling them the benevolent True Torah Jews………………………Aholah. The Head of this serpent is Chabad Lubavitch who have set up the anti-Christ Sanhedrin for their tribal g-d YHWH. Cut the head from this snake and watch the world settle down. But that folks, just ain’t gonna happen, for the WORD is written and True as to what will occur unto the end. In the wake of the deadly ISIS terror attacks in Paris, which killed 129 people, Rabbi Yechiel Eckstein, president of the International Fellowship of Christians and Jews (IFCJ) announced his organization is expanding its emergency aid for French-Jewish institutions across France. 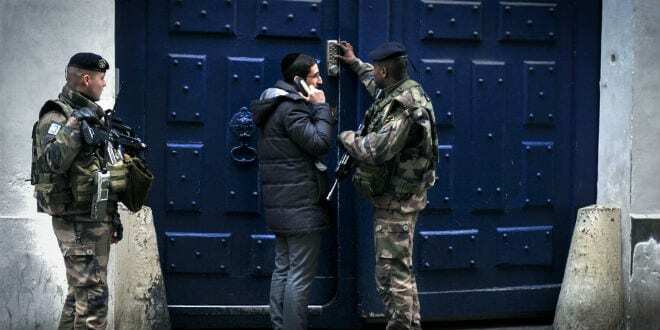 The IFCJ plans on sending more than $86,000 in emergency aid to 25 synagogues and schools run by the Chabad Lubavitch movement in France as part of bolstering security measures, including hiring extra security guards and enhancing existing security systems. According to the IFCJ, the aid is the latest of more than $1 million in security support that the organization began providing to Chabad institutions worldwide after the terror attacks in Mumbai against Chabad and others. Aside from helping to enhance security measures in France and India, the IFCJ has helped Chabad synagogues and institutions better protect themselves in Argentina, Brazil, China, Cypress, Croatia, Denmark, Germany, Nepal, Spain and Thailand. “The last few days, have been living hell for the citizens of France, and especially for the Jews of Paris,” said Rabbi Mendel Azimov, director of Chabad of Paris. “Naturally we feel like sitting ducks, very aware that our community centers, synagogues and educational institutions are in realistic danger at all times. The Serpent may very well be striking the heel of Christ Jesus the Lord God and his living saints, but behold…….the Serpents head is designated to be crushed by Our Lord and Our Testimony of the Only Messiah, Jesus. A certain word in this blog jumped out at me, the word; “alliyah”, derived from the word ‘alah. Then said H559 he unto me, This is the curse H423 that goeth forth H3318 over the face H6440 of the whole earth: H776 for every one that stealeth H1589 shall be cut off H5352 as on this side according H3644 to it; and every one that sweareth H7650 shall be cut off H5352 as on that side according H3644 to it. If you click on the word “curse” in this verse (H423) the word is ‘alah, the word from which “alliyah” is derived. The King of Kings and Lord of Lords, IAM the Lord God Almighty, Alpha and Omega, Savior, Redeemer, Messiah is the ONLY God. Matters not on religion…if any do not serve the Lord, they are of their father Satan…same wannabe g-d…………………….The KJV is very clear on these facts, so I do not put much into Strong’s phonetic translations to disinform those who do not believe the Written word, sorry…but my opinion.